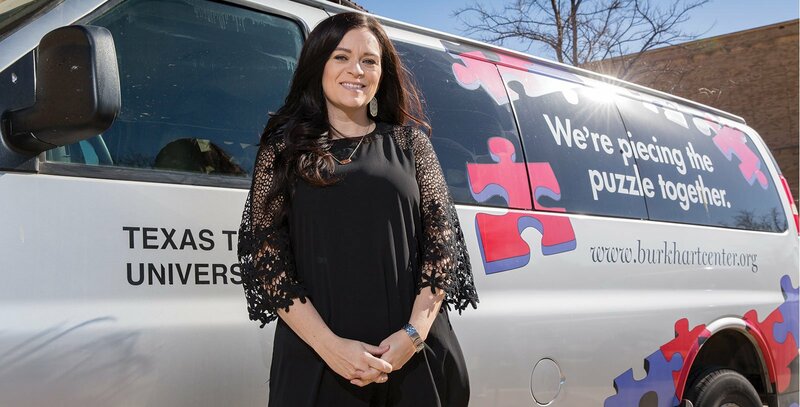 The Burkhart Center for Autism Education and Research, part of Texas Tech University's College of Education, is launching a mobile autism clinic to bring assistance to underserved, rural communities in West Texas. Called Mobile Outreach Clinic for Autism (MOCA), the initiative aims to improve treatment of children with autism spectrum disorder (ASD) by offering training and support to their families and caregivers. MOCA is funded by a $300,000 grant from the Texas Higher Education Coordinating Board (THECB). Texas Tech and six other institutions received awards from THECB's 2019-20 Autism Grant Program, which is aimed at advancing evidence-based, parent-directed treatment models. In all, the seven institutions estimate serving more than 2,200 children diagnosed with ASD. The weekly, single-day visits begin at the end of March. A contact form where individuals can request a visit is available online. "Basically, we're taking the Burkhart Center and putting it on wheels," said Jennifer Hamrick, an assistant professor in the College of Education's Department of Educational Psychology and Leadership, and a board-certified behavior analyst in the Burkhart Center. "While we have been able to provide a multitude of services to families in the Lubbock area, there are still many throughout West Texas who do not have the means to access much-needed resources for their children with autism due to their location in rural areas. Our goal is to travel to these areas, meet with families to determine their individual needs and let them know we are a resource they can continue to reach out to for help." The clinic will primarily offer support to families through parent-directed intervention. This style of treatment involves a child's parents or legal guardians providing various interventions under regular supervision by trained professionals. Parents may learn skills to improve communication or play, pre-vocational training such as self-help, and strategies to decrease problem behavior. Parents will be trained by professionals one-on-one or in group formats in home or community settings. Once parents are trained and intervention has begun, determination for follow-up services will be made with each family. MOCA also can provide full-day group training sessions to school districts or other organizations, addressing basic behavioral needs sometimes seen in children with ASD. The traveling clinic includes a licensed mental health provider offering diagnostics and mental health support, including autism screenings and counseling aimed at addressing unique challenges associated with ASD. Also available are case management services, such as assistance signing up for state waiver programs and information about area resources. Families requiring further assistance may qualify for telehealth services. Computers, mobile devices and video technology in the mobile clinic will connect clients to board certified behavioral analysts and clinic staff at the Burkhart Center in Lubbock. The convenience of this service helps families who have no specialists in their area or limited ability to travel. The mobile clinic accompanies another large-scale outreach effort recently undertaken by the Burkhart Center. A separate $475,000 grant from THECB has allowed the expansion of a series of autism training workshops to the 20 regional education service centers across Texas. Those workshops teach autism specialists and educators about functional behavior assessment, a process used to identify the reasons behind a child's behavior problems in order to improve them. "The Burkhart Center succeeds because of the strength of its partnerships," said Wes Dotson, director of the Burkhart Center. "We work with more than 100 university and community partners across the state to provide resources and support to our families and the professionals who serve them. These grant programs represent some of the most important work we do in our goal to serve as a clearinghouse of information, referrals and support for the West Texas autism community."